The Golden State Mint has a new tandem issue of silver for sale with the image of the Aztec calendar stone on the obverse side. The 1 oz and 5 oz Silver Aztec Calendar rounds are a popular choice for those who value intricate designs and have an interest in the history of Central America. 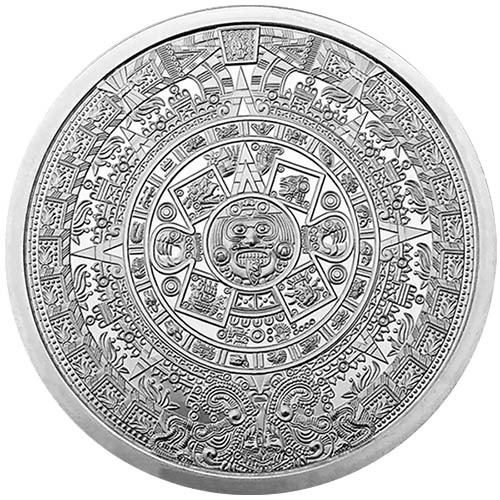 The 5 oz Silver Aztec Calendar Round is currently available to you for purchase online at Silver.com. Rounds ship to you inside of protective plastic flips or mint tubes of 20! Larger release in the Aztec Calendar Round series! On the obverse side is an intricate replication of the Aztec calendar stone. The reverse includes a portrait of Cuauhtemoc. The Aztec calendar stone is often referred to as the Aztec sun stone because it bears the depiction of the Aztec solar deity at its center. The actual stone this round is based on was craved sometime between 1502 and 1521 as the Aztec Empire was in the midst of a downfall at the hands of Spanish invaders. The Spanish colonizers brought smallpox with them, a disease which Central Americans had no previous exposure to or possible immunity against. Between disease and defeat in war at the hands of the technologically advanced Spanish forces, the Aztec Empire was slowly whittled down to its capital city of Tenochtitlan. As the Spanish approached, the sun stone was buried and not seen again until 1790. On the obverse of 5 oz Silver Aztec Calendar Round is a depiction of the carvings from the basalt stone unearthed in December 1790. The design includes the face of Tonatiuh, the solar deity, with two hearts in his clawed hands. He is surrounded by a ring consisting of 20 different symbols representing the days of the month on the Aztec calendar. 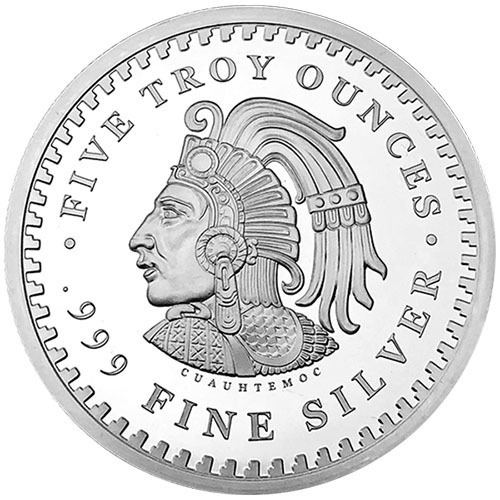 The reverse face of 5 oz Aztec Calendar Rounds includes the image of Cuauhtemoc. As the Spanish closed in on the capital, the Aztec rulers had been killed in battle or died of disease. A council of ruling elders and societal elites elected Cuauhtemoc as the new emperor. He would reign from 1520 to 1521 as the Aztecs fought in vain to keep the Spanish at bay. He was captured in 1521 and executed in 1525 on what many believe were trumped up charges to kill Hernan Cortes, the leading Spanish Conquistador. These 5 oz Silver Aztec Calendar Rounds are available to you inside of protective plastic flips for individual specimens or within mint tubes of 20 for multiples. We encourage Silver.com customers to call us at 888-989-7223 with questions. You can also connect with us online through our live chat and email address features.